For the first time in 25 years, primate staff at the Smithsonian’s National Zoo are celebrating the birth of a male Bornean orangutan. He was born at 8:52 p.m. Sept. 12. Both 19 years old, female Batang and male Kyle bred in January following a breeding recommendation from the Association of Zoos and Aquariums’ Species Survival Plan (SSP). Primate staff have confirmed the newborn is a male. 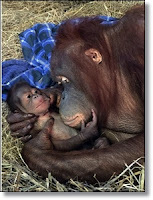 Animal care staff have observed Batang nursing the infant who has been clinging closely to his mother, and they are cautiously optimistic that the newborn will thrive. The Great Ape House will remain closed to provide Batang a quiet space to bond with her infant. Animal care staff believe that Batang had successfully conceived Feb. 2, based on a human pregnancy test. They confirmed pregnancy with a subsequent ultrasound. The Zoo announced Batang’s pregnancy June 14 through a Facebook Live broadcast of one of her ultrasounds. Over the past 12 weeks, the Zoo has provided weekly updates on Batang on Facebook, Twitter and Instagram using the hashtag #OrangutanStory and will continue to share behind-the-scenes photos and videos as news breaks. For the past three years, keepers have been acclimating Batang to the experiences of motherhood and training her to care for an infant. Building upon behaviors Batang has learned through routine training sessions, keepers have trained Batang to hold a baby upright, present it to keepers for bottle feedings and place the baby in a specially designed box when asked. This training enables staff to retrieve the infant if medically necessary and evaluate its health in a way that is safe and not stressful for the animals.